Antennas for Communications specializes in custom designed passive microwave circuit functions. Numerous diplexers, filters, rotary joints, feeds and launcher systems, orthomodes, and low loss transmission lines have been designed to meet the exacting requirements for space, aircraft and ground based applications. Frequency bands are covered from a few hundred MHz to 90 GHz. Most microwave component applications involve unique requirements. These include a particular function to be performed, a specific operating frequency, plus minimum loss. Our engineering staff has the specialized experience to design microwave components to meet challenging requirements, without compromising performance. AFC's experience and organization is dedicated to efficiency and shortened response time. Microwave applications often require unique manufacturing and testing processes in order to achieve desired performance. As part of our team, we maintain a verified select vendor and subcontractor group with capabilities complementing our own. Typical examples of specialized requirements include waveguide components for aircraft and space applications. These components must have the ability to withstand high shock, vibration, and thermal stress; yet remain extremely lightweight. The Microwave Component Division employs several different manufacturing techniques to achieve the desired results. The electroforming technique is used for complex internal contours, and for providing high strength with light weight. Computerized Numerical Controlled mills and lathes, on all four axis, are used for filters and slot arrays. This technique also provides high repeatability over an extended time frame. Electric Discharge machining is used when standard techniques are not adequate. The different standard welding, soldering, and dip brazing processes are used as required. The Microwave Component Division offers several different product categories. The entire product line covers components operating in the frequency range from 10 MHz to 90 GHz. Designs for special applications with operating frequencies up to 300 GHz are also available. Space applications generally include stringent performance specifications, along with severe weight limitations and exacting environmental and quality assurance requirements. All aspects of AFC performance, including computer analysis, manufacturing process design and verification, shock, vibration and thermal stress emphasize conformance to quality issues and have been proven against NASA and DOD programs. Space and aircraft qualified electroforming process insure a full range of thin wall, high strength components meeting the desired dimensions. Tallguide TG31 for 33 to 55 Ghz. Designated the Tallguide ® Series, a complete waveguide component product line addresses the excessive insertion loss problem encountered standard WR type waveguide. Tallguide transmission loss is a factor of 10 lower than standard WR type waveguide. Typical success stories are a Ku-band Uplinks with an WR75 IFL Loss of 6 dB per 100 feet reduced to 0.7 dB with the TG115 Tallguide; the ASDE-3 18 Ghz radar WR62 loss at 7 dB per 100 feet improved to 1.0 dB with the TG87 Tallguide; and the MILSTAR 23 dB per 100 feet WR22 transmission loss significantly reduced to 4.5 dB with the TG31 TallGuide. The standard product line is supported by precision transitions into Tallguide, mode suppressors, bends, twists and straight waveguide sections. Thin wall electroformed parts are available for space and airborne environments. AFC provides a complete electrical and mechanical equivalent microwave product line for the Western Electric network. The microwave components reflect extensive support to the Bell Operating Companies, AT&T, and AFC's conical horn antenna product line. The equivalent product line encompasses axial ratio compensation networks, diplexers, filters, mode launchers, mode suppressors, pressure windows, dummy networks, transitions, terminations and water traps along with a comprehensive list of conical horn antennas. Antenna feeds are designed according to operating frequency, antenna characteristics and pattern, power requirements and interface. Many of AFC's feeds complement our parabolic dish antenna product line, from 0.76 meter through 7 meter diameter, and conical horn antennas. For high power applications, the entire feed is supplied with a pressurization dome cover. Custom feed networks include a C band Ortho Mode Polarizer for large beam waveguide antenna systems. Combining networks provide 4 or 6 port access to a single antenna. A typical 6 port network separates vertical and horizontal polarizations at 4, 6 and 11 GHz. Custom modifications are routinely accomplished to meet individual requirements. For more details on AFC's commercial feed systems, see Satellite Dish Antenna Feeds. Most aircraft microwave components involve complex configurations because of physical limitations. Radar antennas, located in the aircraft nose, are in proximity to the communications center. Tactical aircraft present additional requirements with multi-purpose radar, ECM and threat requirements plus more stringent shock, vibration and stress specifications. AFC is prepared to design microwave components to such exacting demands. High power coaxial to dielectric waveguide transitions and related components have been supplied to the Princeton Tokomak reactor and the Lawrence Livermore Laboratories for use in fusion experiments. These experiments involve power levels of up to 30 Megawatts. The supplied components are similar to our high power antenna feed lines for radar applications. 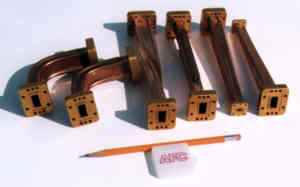 This category includes straight lengths of rectangular and circular waveguides, plus bends and twists. The waveguides are equipped with MIL or IEC flanges and are available in any length up to 12 feet. Lengths up to 20 feet are available on special order. The waveguides are supplied with stainless steel hardware and pressure gaskets. AFC manufactures, markets and sells worldwide satellite dish antennas, conical horn antennas, radomes, antenna feeds, microwave and waveguide components, ultra low loss waveguide transmission line Tallguide ®, and shelters. Our customers serve the satellite, broadcast, communications, radar, weather and cable industry, defense, government, and government agencies worldwide.